Honor killing is the act of killing a relative – typically a girl or woman – who is thought to have brought dishonor upon his or her family. Although the practice of honor killing originated in the Eastern world, 25 to 28 honor killings occur in the U.S. each year, according to the AHA Foundation – a nonprofit organization in the United States working to end honor violence that shames, hurts or kills women and girls. In her 2007 novel “Light of the Desert” (published by AuthorHouse), author Lucette Walters sheds light on the act of honor killing, giving a fictional yet human face to a very real crime to which many women fall victim around the world. Walters’ young protagonist’s name is Noora Fendil, the favored daughter of an influential Middle Eastern businessman. Noora is suspected of bringing shame to her family after her jealous sister hatches a devious plan to destroy Noora’s upcoming marriage. As a result, Noora’s father attempts to drown her. Her escape from her father’s clutches takes her on a lengthy journey from Jordan through the Mediterranean and eventually to the United States. Along her path, Noora must hide her true identity in hopes of one day returning to her home and proving her innocence. Concurrently, she must evade her former bodyguard who vows to find Noora and follow through on her father’s original plans. To purchase a copy of the book, readers may visit https://www.amazon.com/Light-Desert-Lucette-Walters/dp/1425977480. Born in Alexandria, Egypt, Lucette Walters grew up in Paris and later relocated to Chicago with her family. She later moved to Los Angeles, where she pursued a career in film. 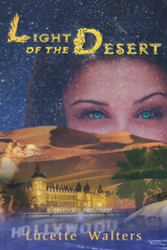 She recently completed the screenplay adaptation of “Light of the Desert” and is working on her second novel. She currently lives in California.